It often happens that the small-scale, programmatically simple design tasks tap into the basics of the practice and remind of what is the initial creative act in designing – Asking Questions. 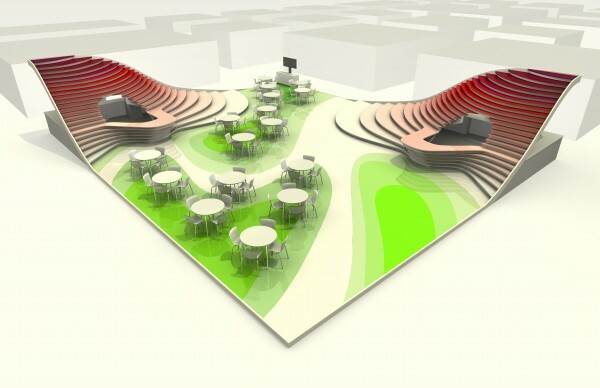 To most with formal architectural education, designing trade show pavilions presents starting challenges that help solidify their understanding of space. By returning to questions, small competitions act as a bloodletting treatment for the current global discourse. These also take on a didactic role for architecture beginners, reminding them of the complexity of the design process that can be revisited, but certainly not avoided by relying solely on the abstract art of mathematics. The winning proposal for the Ceramics of Italy Competition is a recognizable, functional and versatile space, achieved by using the design elements organically and making them part of a clear, cohesive architectural thought. 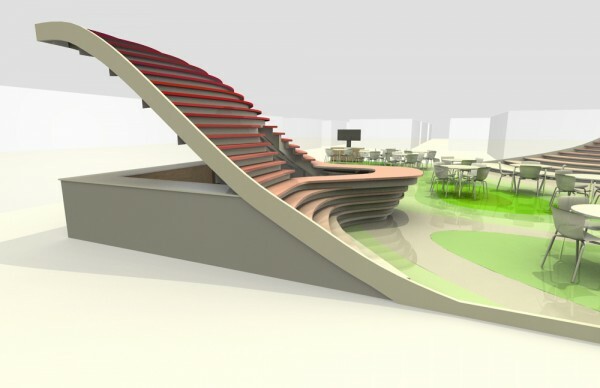 The project marries archetypal spatial preoccupations with modern technologies and computational design. The 3,000 square feet rectangular trade show pavilion comprises a café, information and reception desks and storage spaces. Lifted at the opposite corners are two seating areas, reminiscent of Italian piazzas. These are progressively transformed into information and reception desks. Layering of the platform into gradual steps allowed the architects at e+i Studio to extensively showcase the Italian tile palette through variations in color. 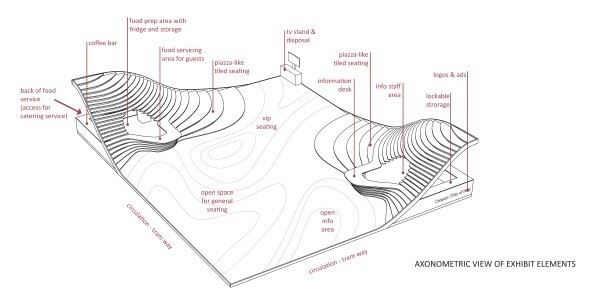 The gridshell wood structure supporting tile mounds creates service areas below, leaving the space between the slopes for gatherings and dining. 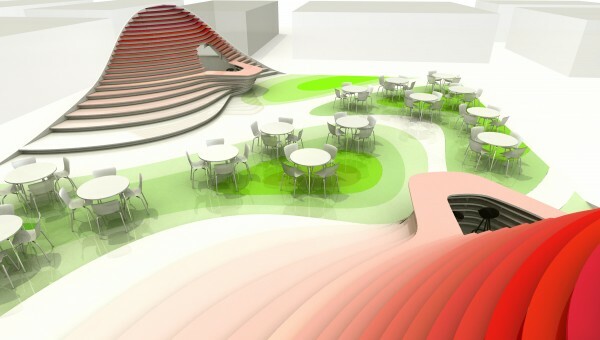 Piazza Ceramica can be recreated in many different configurations. The structure, manufactured with CNC and water jet technologies, consists in producing one module and its mirror counterpart, which can be combined and reused in multiple assemblies.